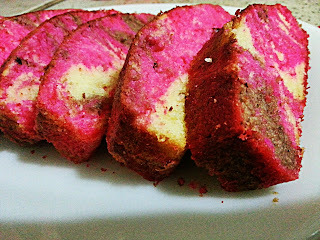 Marble Cake had been everyone favourites. Whenever you see a marble cake, you can’t resist having a bite. It’s a moment of excitement which is inexpressible. So, to my dear viewer’s thanks for the support, for reaching 1000 over viewers. This is for you. 1. Preheat oven to 170 Degree C. Generously butter and flour cake tin. 2. Set aside, in a bowl of shift flour, salt & baking powder. 3. In another bowl, whisk butter and sugar till light and fluffy. 4. Add one egg at a time and whisk until well combined. Add vanilla essence and buttermilk. 5. Fold the batter with flour mixer gently till smooth. 6. Separate the mixture into 3 different bowls. 7. Mix cocoa powder into first bowl and rose pink colour on second bowl. The third bowl is the vanilla mixture. 8. Alternate spoonful of vanilla, chocolate and red mixtures into cake tin. When all the mixture used up. Swirl the batter to create marble effect. 9. Bake for 35 min until cake tester inserted into the centres, comes out clean.Transfer to a rack to cool.Cake can be kept in an airtight container at room temperature up to 3 days.